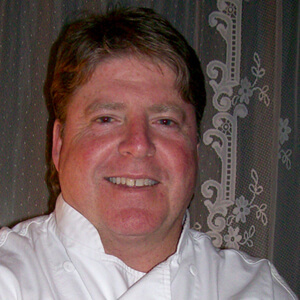 Chef John Newman opened Newmans at 988 in February 2006. A French Italian Eatery in Midtown Cannon Beach, Newmans serves an à la carte menu, as well as a chef’s prix fixe menu that changes nightly. Adorned with white tablecloths and fresh roses on each table Newmans offers an intimate dining atmosphere enhanced by the music of legendary singers such as Frank Sinatra and Tony Bennett. “Simple Elegance” is the goal. Newmans at 988 was named “Restaurant of the Year” by the Daily Astorian in 2006 and continues to receive many culinary accolades. Chef Newman attended the Culinary Institute of America in New York and was granted an internship at the Turtle Bay Hilton on the island of Oahu, in Hawaii. Once he graduated from school in 1990, he traveled to Europe to work. Coming back to his roots on the West Coast, he landed at the prestigious Silks Restaurant at the Mandarin Oriental Hotel in San Francisco working under Ming Tsai and Ken Oringer. In 1995, following a trip up the Oregon Coast, John and his wife, Sandy, moved to Pacific City to manage a local restaurant before John took a job as Executive Chef for the Stephanie Inn Dining Room in Cannon Beach. Chef Newman was thrilled to be back in the hotel business and immediately became known as one of the premiere chefs in Oregon. He stayed at the Stephanie Inn for 8 years. Chef Newman has cooked several times at the James Beard House in New York City including being selected as the first of twelve Oregon chefs to cook there in 2003 to commemorate the hundred-year anniversary of James Beard’s birth, and celebrating his birthplace — Oregon. He is 4-time champion at the Tillamook County Iron Chef Black Box competition and has competed in the Iron Chef Oregon competition at the Bite of Oregon making it to the finals. He has competed and won several times at the Iron Chef Goes Coastal. At the Stephanie Inn Dining Room, he received numerous awards including being a top-two finalist for the Restaurant Good Neighbor award and a recipient of the Gerry Frank Golden Fork award. He participated in a French Chef exchange with the Hotel L’Aigle Noir in Fountainbleu in 1999 and was a guest chef at the 2002 Capitol Holiday Tree Lighting Ceremony in Washington D.C.
John was the Culinary Instructor at Seaside High School where his students won the Oregon ProStart competition 2 years in a row sending them to Nationals. He was the first coach of the ProStart team in its inaugural year in 2005 and stayed until 2007 before becoming the Culinary Instructor at Tongue Point Job Corps in Astoria where he taught through the 2009 year. John has started his own restaurant consulting business — Chef John Newman Consulting — and is available to help with hiring, training and employee relations; recipe and menu development; and financial issues including budgeting, profit and loss statements, and food / labor costs. He is Vice President of the Cannon Beach Chamber of Commerce. John has participated in the International Pinot Noir Celebration in Oregon as well as many charitable events — March of Dimes Signature Chef’s Auction, ZooLaLa, and the Bite of Oregon to name a few. Chef Newman received his Certified Executive Chef title in September 2008.